There’s a place where dreams really do come true, you just have to find it. For two Conestoga BScN students, an international exchange this summer at the Aga Khan University Hospital in Nairobi, Kenya was their dream come true. Even though Donalee Bearinger and Gris Rivera had to share a small bedroom for three months, they managed to find a way to make it the experience of a lifetime. At a Lunch and Learn session on Oct. 28 at Conestoga College, Bearinger and Rivera shared their recent experience. The two students told those in attendance that they didn’t have accommodations prior to going to Kenya. They were trying to arrange them, but it was difficult to find a good place. They ended up staying in a bed and breakfast for about a week before they found a family to live with, right across the street from the hospital. “We tried connecting and networking with people at the hospital to see if there was somehow a way to find a place where we could safely commute and feel safe in general,” said Rivera. “The experience was baffling,” she said. Rivera spent her three-month term working in the maternity ward while Bearinger spent hers in the pediatric ward. As one of the two largest hospitals in Africa, it is recognized as a teaching hospital for nurses and medical interns in East Africa. The hospital hosts several wards including surgical, medical, ICU, maternity and pediatric and also has a heart and cancer centre and seven outreach clinics in Kenya. Bearinger and Rivera spent their time helping the “richer population,” but also spent time working for a medical camp, run by the hospital, where they helped those who don’t have the money to go to a hospital. “I picked up a baby because the mother was being treated, and I put my hand behind the bum and the diaper was soaked. They were waiting all day,” said Bearinger. “But it was nice for them to get the treatment that they really need,” said Rivera. Bearinger said it’s like “a whole other world,” adding you can’t compare health care in Canada to health care in Africa. “They have so little, but they’re willing to give so much,” said Bearinger. She described how people in the slums offered them food as they walked by. There is lots of garbage everywhere and no sewage system. “I realized that as a nurse, it’s important to know and do, but it’s more important to be willing to step out of your comfort zone,” said Bearinger. “As nurses you learn, but you don’t understand until you see it for yourself,” said Rivera. The international exchange program is held in association with McMaster University, which Conestoga is affiliated with, and Mohawk College. Bearinger and Rivera were two of the lucky people who got to participate in the program. 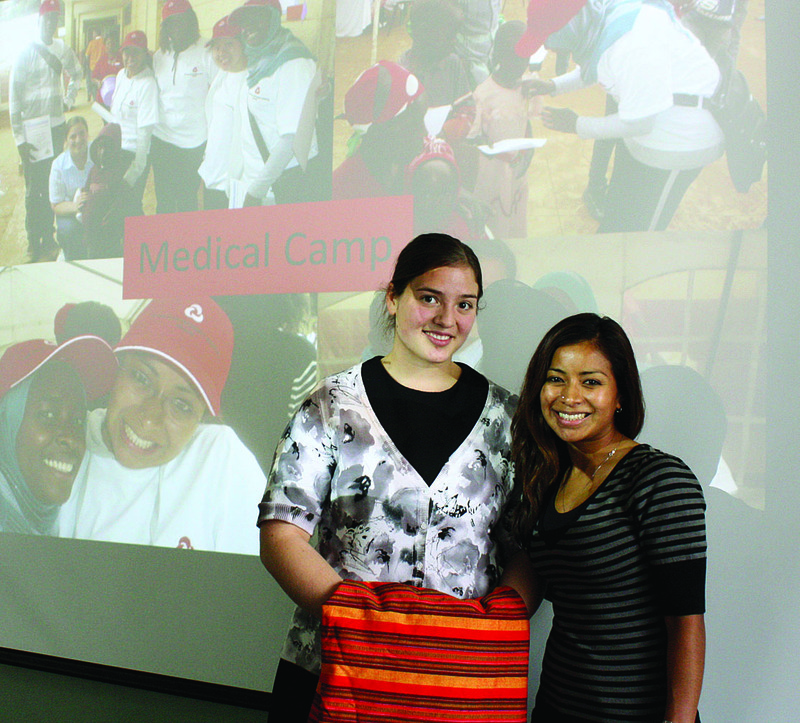 It first started in 2004-05 and sends between one and eight students to Africa or Asia. “I think the biggest challenge was the language,” said Rivera. The girls had to teach patients how to take better care of themselves so they wouldn’t contract diseases. Because of the language, they had to incorporate a lot of hand gestures and actions to get their lessons across. “It was all very disorganized but everything always turned out OK,” said Bearinger. They said the Nairobi community and hospital had a very “hakuna matata” (no worries) attitude toward everything. While away the two students had to worry about keeping up with their studies. Homework had to be done after work, leaving little time for anything else. According to the McMaster website, they have been doing placements since 1984. They have sent over 150 students to more than 25 countries worldwide and to six Canadian provinces and three territories. For Rivera and Bearinger, this opportunity was a dream come true. They got to go to a foreign land, help those in need and change lives.